When it is more efficient to take the weighing equipment to the load! This rang of portable pallet beam scales from Adam Equipment has been specifically designed with simplicity in mind. 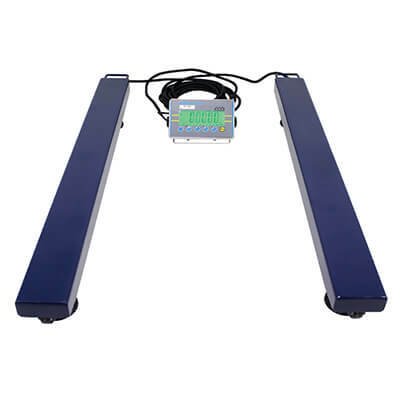 These floor beam scales are ideal for all types of weighing applications where portability and flexibility are required, such as weighing pallets or long loads (e.g. tubes or pipes), for use as a warehouse or dispatch scale, or simply where it is more efficient to take the weighing equipment to the load. 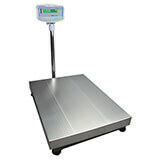 This Adam pallet beam scale is not only easy to use, it's also easy to move, thanks to the built-in wheels and handles. The system comprises of two robust 1200mm long, mild steel weigh beams and a stainless steel indicator. 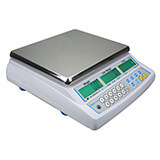 The indicator has a large clear backlit display, full tare range and check weighing capability.